Most of you should know that Wendy has moved to a new home which has been renovated super nicely! You can find Part 1 of her home tour (Living Room + Kitchen) HERE if you haven't seen it! The indented mirror in the entryway shoe cabinet! Super cute photo of Mike & Wendy on the right! Lucky girl can fit in a bathtub into her bathrrom! 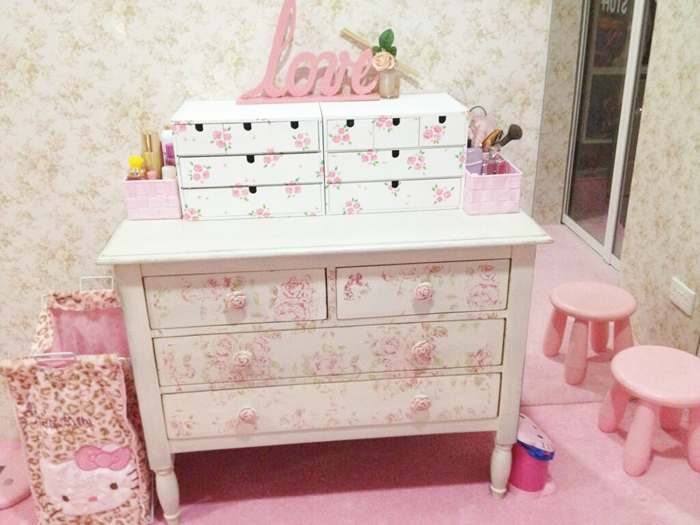 And here's one of the drawer sections in her Princess Room! The small cabinets on top were hand-painted white, with each flower painstakingly painted by Wendy! Ok here's the desserts table part LOL. A lot of the desserts were made by the owners themselves, from Crème Berry! I love the set-up that they did for Mike & Wendy that day; super pretty! Those dessert cups were super good! It's kinda like creamcheese with crumble I think? Mini little red velvet cupcakes! Loved their crème brulées! Saw them preparing these at Wendy's kitchen itself! Over at the Churros station, also by done by the staff of the dessert table! Get your churros warm & crunchy instantly! And to revamp your room! 11 comments on "Xiaxue's housewarming"
Aww that looks really nice! I love this bright sea theme! Wendy must be really lucky. All the food looks so great! Uh why is there a "should"? I don't feel it's necessary to infringe on people's privacy just to have pictures for my blog. It's not anyone's business who Xiaxue's friends/family are & thats's up to her to post if she wants to. I would feel so embarrassed to ask people to take pictures, regardless of whether it was her housewarming or my own family members. Wow I cannot stop drooling! I want churros so badly now! ahh so nice and awesome! It doesn't matter what the reason was. There could very simply be none. I just didn't think about it & I'm not the sort that likes to usher people into photos & what not. I just dislike the way you made it sound like I, or Xiaxue, had something to hide & the "should" this/that tone of your comment.